Do Seamless 5G Communications Start With Flawless 5G PR? Last March, NTT DoCoMo, KT, and China Mobile announced technical collaboration on 5G, each one with an Olympic event in mind: Pyeongchang 2018 for Korea, Tokyo 2020 for Japan, Beijing 2022 for China. China Mobile, who started 5G development 5 years after DoCoMo, is clearly the laggard here. But by its sole presence, the World's biggest operator already brings considerable leverage for the standardization as well as for the ramp up phases, securing the full involvement of an ever progressing Huawei*. - on November 19 with Ericsson (MIMO 10 Gbps reception on 15 GHz). A concise and impressive display, and a nice PR operation for a leader willing to show it covers all the bases. I'm curious to see how KT follows. In a nation already 70% converted to 4G LTE, Korea's #2 mobile operator has been the most vocal about 5G, and even about 4.5G following the launch of GiGA LTE last June. The names of Samsung, Ericsson-LG, Alcatel-Lucent and Huawei have been announced for collaborations at the new 5G Research and Development Center (in Umyeon-dong, Seocho-gu, Seoul), and such technos as MIMO, Millimeter Wave, 3D beamforming have already been tested, like multipoint transmission in a moving car (with Ericsson last May, Distributed MIMO, 2 Gbps). 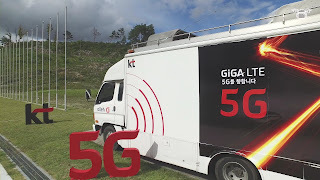 KT also demonstrated 'core technologies' for 5G (5G drone, 5G hyper-virtual reality, 3D hologram), which got a few Korean media confused between 5G-friendly services and 5G 'networks'***. That's one of the differences between DoCoMo's 'engineer/product/provider' PR and KT's 'marketer/service/user' PR. We already saw how the pedagogy of 2.5G, 3G, or 4G worked, and we already know that quantum leaps at the operator's level can seem mere upgrades at the user's level. Let's not fret over hair-splitting debates between 'post-4G', 4.5G and 'pre-5G'.